In January 2018 NOAA's Gulf of Maine Ocean Forecast System (GOMOFS) , part of the Operational Nowcast and Forecast Hydrodynamic Model Systems (called OFS), became operational. GOMOFS is one of 14 regional models providing nowcast and short-term (typically 0-48 h) forecast predictions of pertinent parameters (e.g., water levels, currents, salinity, temperature, and waves). Unfortunately NOAA's OFS data is not available in Grib file format, consequently standard weather routing and Grib viewing software cannot utilize these high resolution tidal forecasts. SailFast has solved this problem by translating the raw NOAA data into customized binary files readable by SailFast Version 10 and later. 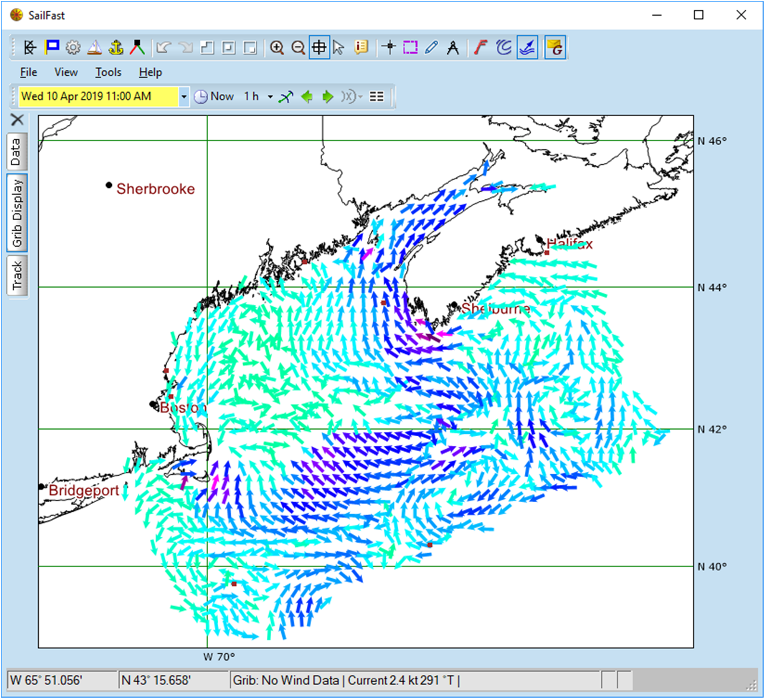 Once downloaded to SailFast, Gulf of Maine tidal currents can be displayed and used for weather routing as if they were standard Grib files. 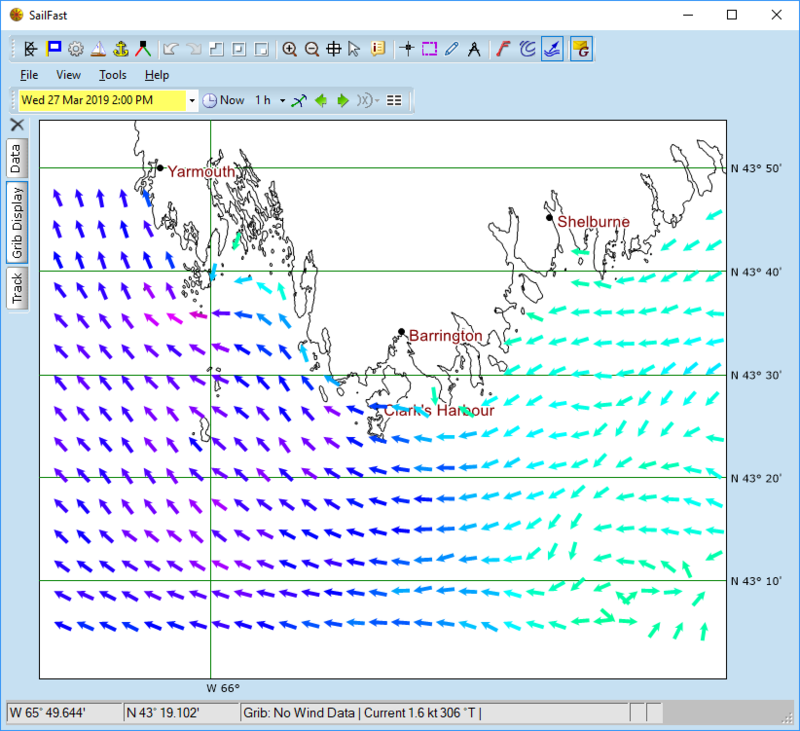 Racing and cruising sailors who frequent the Gulf of Maine, Bay of Fundy and Nantucket Sound waters should be excited to have these detailed tidal currents available. Weather routing for the bi-annual Marblehead to Halifax race will be greatly enhanced, especially if the navigator is considering a passage through the strong currents approaching Brazil Rock. GOMOFS is a 3-dimensional Regional Ocean Modeling System (ROMS) developed by the ocean modeling community and supported by Rutgers University. The model's orthogonal grid has 1173 x 777 horizontal grid points with roughly 700 meter horizontal resolution. The vertical grid follows the terrain and consists of 30 model levels. 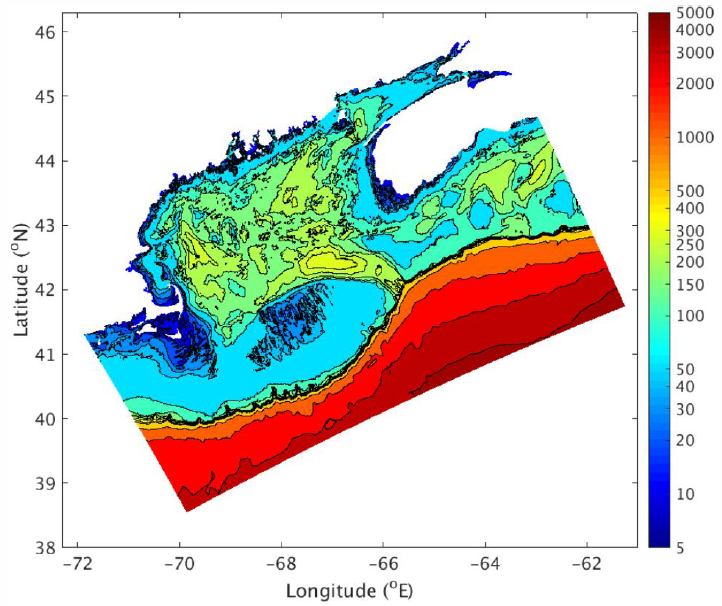 The grid bathymetry of the Gulf of Maine ranges from 3 meters near the coast to 4,500 meters along its southern open boundary. A contour plot of the modeled depths is shown in Figure 3. NOAA runs the model 4 times per day at 00z, 06z, 12z, and 18z UTC. Each model run's output includes forecasted surface currents at hourly intervals for the following 1 to 72 hours (3 days). GOMOFS combines a tidal model with wind driven surface current and is forced by the NAM (atmospheric forecast) and Global RTOFS (ocean forecast) model outputs. Learn more about the GOMOFS model's development and validation against historical data. As has been noted, the GOMOFS tidal forecasts are not available as Grib files. OFS data is stored as NetCDF files. NetCDF has the advantage of more fully documenting the datasets, which can be important when researchers are trying to analyze disparate climate data other wide time periods. Unfortunately NetCDF produces very large files compared to Grib and are cumbersome to use. 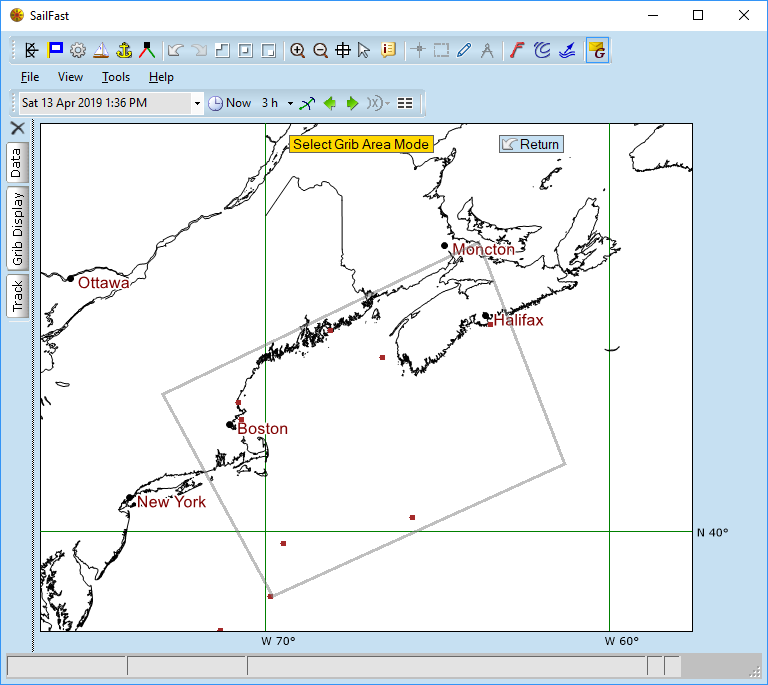 The SailFast weather routing program accesses GOMOFS using the "Saildocs" tool dialog shown in Figure 4. This tool is normally used to specify and download Grib files from Saildocs. For general Saildocs info see http://www.saildocs.com/gribinfo . For convenience the same tool is used for GOMOFS data download. The example screen shot shows that the "Grib Model" has been specified as GOMOFS, the specified data parameter is surface current, data grid is 0.1 degrees, forecast interval is 1 hour and forecasts for the next 3 days is requested. This will result in hourly forecasts spanning 1 to 72 hours from the latest available model run, which will have been at either 00z, 06z, 12z, or 18z UTC. The bounds of the lat lon grid are set with the Select Area button, which displays the Figure 5 screen. The gray outline indicates the limits of the area covered by GOMOFS. The user clicks and drags a desired rectangular area and then returns to the Saildocs tool. Create produces the required text using the Saildocs syntax, in this case "GOMOFS:43.0N,44.7N,70.6W,64.7W|0.1,0.1|0,1,..72|CUR." The Saildocs syntax is used for convenience, however if it was sent to Saildocs an error would result since GOMOFS is not a model that Saildocs supports. The Estimated File Size is useful for understanding how large the download could be for the requested forecast area, resolution (grid spacing) and forecast duration. Size won't be much of an issue with a home or cell phone connection, but will be with a satellite phone. For Marblehead to Halifax racers a 3 day forecast can be downloaded the morning of the race while high speed internet access is available, avoiding the need to do downloads of tidal current during the race. Downloading a GOMOFS forecast requires some form of internet connection to the client Windows PC running SailFast. Send Grib Request sends the request to the SailFast server using an efficient http protocol. 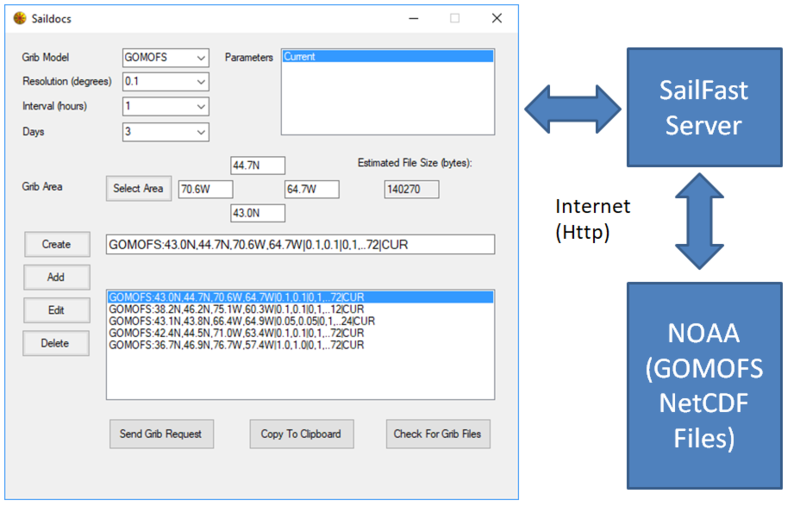 The server interprets the request then downloads the required NetCDF data files from the NOAA server to the SailFast server. The files are then converted to the regular lat lon grid requested. Because of the large NetCDF file sizes this process may take 10-12 minutes to complete. Subsequent requests for the same model run (ie. 00z, 06z, 12z, or 18z UTC) will be much faster. Check For Grib Files sends a message to the SailFast server to see if any Grib or GOMOFS files are ready for download. The user can check the file size before deciding to download. From the file name, one can also determine the date and time of the model run. This is useful to avoid downloading duplicate data from a model run that had previously been obtained. GOMOFS is an operational system. As such NOAA maintains quality controls to ensure accuracy. They state: "All CO-OPS official real-time products, including nowcast and forecast guidance from GoMOFS are monitored by the CO-OPS's Continuous Operational Real-Time Monitoring System (CORMS). CORMS provides 24 hour per day, 7 days per week monitoring and quality control of sensors and data in order to ensure the availability, accuracy, and quality of tide, water level, current, and other marine environmental information. CORMS is intended to identify invalid and erroneous data and information before application of the data by real-time and near real-time users." Each model run is evaluated and the quality control status reported on the GOMOFS web site. The inherent accuracy of the model is evaluated using an established "skills assessment." The accepted error criteria for skill assessment are: water level 0.15 m, current speed 0.26 m/s, current direction 22.5 degree, temperature 3.0 °C and salinity 3.5 psu. A NOAA Skills Assessment Report gives the results of comparing GOMOFS nowcasts and forecasts from 1/1/2017 to 6/30/2017 to actual buoy and tide station measurements. Figures 6 and 7 show the model error compared to buoy measurements at 5 locations. According to the skills assessment criteria the acceptable level of speed error is 0.26 m/s, or 0.5 knots. Generally error increases slightly as the forecast time increases, so error at the 48 hour forecast is more than the 0 h forecast. 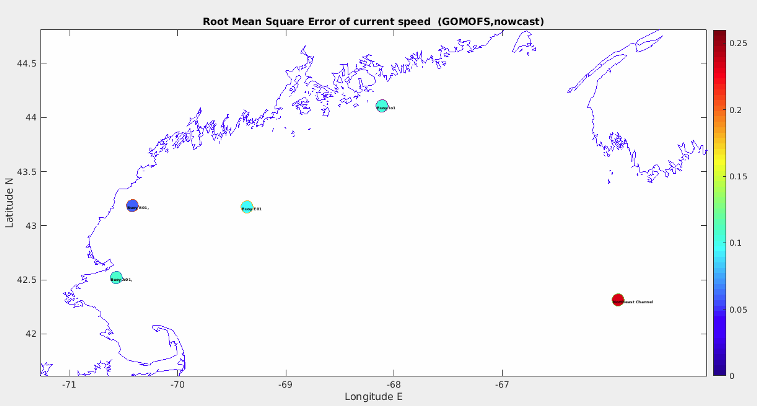 For the 4 buoys closest to shore the error is typically 0.1 m/s (0.2 knots). The Northeast Channel buoy error is roughly double at 0.23 m/s (0.45 knots). The report also includes surface current direction error. For the 4 coastal buoys the error is < 10 degrees while the Northeast Channel error is ~ 33 degrees which is greater than the 22.5 degree limit. The model developers attribute the greater error in the Northeast channel to the more complex hydrodynamics that exist there. The deep channel is the major pathway for water mass exchange between the Gulf and the open ocean.